For most of human history, we effortlessly consumed (nose-to-tail) the things we needed for health and happiness. Like the fertile ground that we once walked upon, we were a natural extension of this earth. In the modern world, we unknowingly struggle to fulfill our nutritional needs in order to support and sustain a vibrant, disease-free life. Our mission is to offer the highest quality line of whole-food supplements with the purpose of putting back in what the modern world has left out — Nourish your way to health and happiness. Our nose-to-tail product line is always from grassfed, inspected animals born and raised without the use of pesticides, hormones or antibiotics. Health of livestock used for manufacturing in New Zealand is closely monitored by a world leading biosecurity system that is second to none, and is a global exemplar. Strict government licensing, auditing and certification procedures mean that our genuine New Zealand freeze dried products can be used with complete confidence in their origin, safety and efficacy. Freeze-drying preserves color, nutrients and biological activity of components leaving the nutrients in the same balance as found in nature. Six capsules daily or as directed by a healthcare professional. Most of us know that liver is good for you but do you know why, and if so, why aren't you eating it? Grass-fed and grass-finished liver from pasture-raised cows is among the most nutritionally dense foods in existence. This type of high quality liver is loaded with vitamins, minerals, proteins and healthy fats that support optimal collagen synthesis (think skin, hair and connective tissues), strong immune function, and heart, brain and liver health. Our early ancestors knew this, which is why their traditional diets included the frequent and nourishing consumption of this nutritional powerhouse. If you can't stomach the taste of liver, you can easily throw a few capsules down the hatch without incident — beef liver capsules are virtually tasteless. If you're looking into a high quality desiccated liver supplement, see below so that you know what to look for. * Liver contains a source of iron bound to hemoglobin (heme iron) of which up to 33% is absorbed compared to non-heme iron which can have as little as 2% absorption. In addition to these benefits, high quality beef liver provides all the fat soluble vitamins (A, D, K & E) in highly usable forms, and provides meaningful amounts of folic acid, copper, zinc, chromium and hyaluronic acid. If you're still not convinced that liver needs to be on your menu, you probably don't know a whole lot about vitamin A. If you're not consuming liver one to two times per week, you're not getting adequate vitamin A. If you're not getting adequate vitamin A, you're likely not optimizing your skin, hair and nail health nor are you supporting robust collagen production for other key connective tissue systems (e.g. cartilage, ligaments, tendons, gums). MOST OF US ARE NOT GETTING ENOUGH VITAMIN A... ARE YOU? Many people believe that they can get enough vitamin A from their fruits and veggies—simply put, they can't! Fruits and vegetables are high in a family of phytonutrients called carotenoids (e.g. beta-carotene). Because of this, many people (and websites alike), believe that these foods provide vitamin A; however, they do not. The body must convert these compounds into vitamin A; but in humans, this process is inefficient and hardly takes place. The data shows that only three percent or less of carotenoids from plant foods are absorbed. In contrast, eighty percent or more of preformed vitamin A from animal sources (i.e. liver) is absorbed. If you're not consuming liver one to two times per week, you're not getting adequate vitamin A. If you're not getting adequate vitamin A, you're likely not optimizing your skin, hair and nail health nor are you supporting robust collagen production for other key connective tissue systems (e.g. cartilage, ligaments, tendons, gums). The simple solution is to eat liver twice a week. If you're just not going to do it, consider a high quality liver supplement. Our genome has evolved with the nourishment of liver since the beginning of time. Liver is especially rich in preformed vitamin A, vitamin B12, choline and bio-available iron. High quality beef liver supports our connective tissue systems (skin, hair, gums, ligaments, tendons, etc. ), energy metabolism, immune function and heart, brain and liver health. Not all liver is the same. Look for a high quality beef liver that comes from pasture-raised, grass-fed cows that are hormone, pesticide and GMO free. If considering a supplement, look for one that is ultra pure (without binders, fillers (or) flow agents) and look for the freeze dried variety as these have been shown to optimally preserve nutritional factors and co-factors. 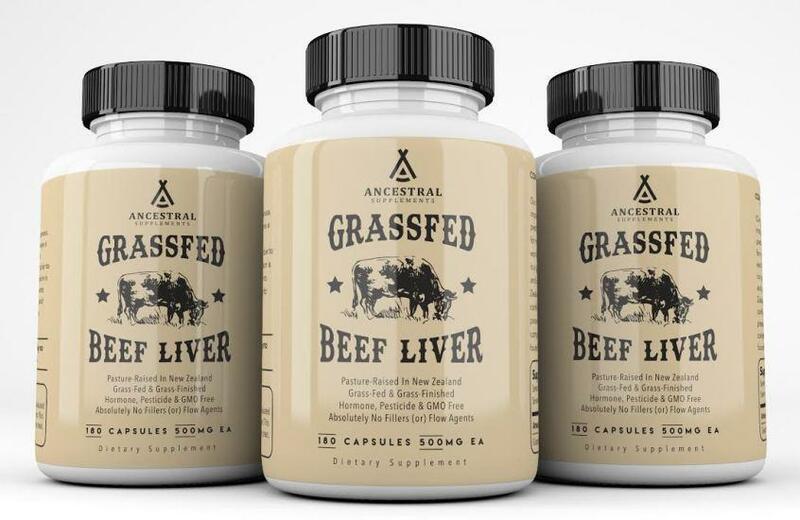 High quality liver from pasture-raised, grass-fed cows is completely safe to consume. There is a common misconception about the liver being a storage depot for toxins which couldn't be further from fact. One of the many roles of liver is to filter toxins and send them to be expelled — usually in the urine via the kidney. In other words, the liver does not hold on to toxins, it expels them. The liver does act as a storage depot for vitamins, minerals and glycogen. Rest assured, liver from healthy animals is safe, nutritious and time-tested. Need more assurance... Recall that liver is rich in choline, folate and B12. A diet rich in these nutrients supports methylation. Amongst other things, methylation is central to detoxification. What's more, is that without adequate choline (most Americans) fatty deposits may accumulate that contribute to non-alcoholic fatty liver disease. Downstream issues include compromised detoxification, high cholesterol and memory problems. The take home message is this... grass-fed, pasture-raised liver is not only safe to consume but one could say that its nutrients are required to support and optimize our own detoxification pathways. Enjoy! I purchased this grasfed beef liver because I have been suffering from chronic fatigue syndrome and also adrenal insufficiency, and tissue thyroid resistance. I have been purchasing several high dollar supplements every month for over a year with a very slow and challenging recovery. I read that beef liver, specifically from grassfed beef, is one of the most nutrient dense foods to eat. Well, I didn't have the nerve to cook up a beef liver and thought I would look into a supplement form. I referred to this product's website after finding it here on Amazon and I also talked directly with the owner regarding some questions I had. Brian, the owner of this company, was so helpful and he answered all of my questions in a way that I felt very confident in making the purchase. I take the recommended dose of 6 capsules every day. I split them up throughout the day but you can take them all at once if you wanted to....and, you can easily take these on an empty stomach with absolutely no issues....which is a blessing for me! After a couple days of taking this I noticed a huge improvement in my overall wellbeing and after a week of taking it I had more energy than I can remember in at least a couple of years. Everyone around me is commenting on how well I look and they have noticed that I'm pretty near my old energetic self again. This beef liver is very easy to take! I can not detect any smell that would be unpleasant at all...which I was a little worried about after reading about eating beef liver. There is zero after taste, etc. The nutrients you get from this liver are highly bio-available and your body know what to do with them and will absorb them so easily since they are not chemically isolated or man-made nutrients. This is how nature intended for your body to get it's nutrients! Directly from the sources in nature. If you are living a paleo lifestyle....these will be perfect for you since they are from such a clean source. If you suffer from any auto-immune disorder or fatigue resulting from a chronic condition or even anemia....please, I can't encourage you enough, purchase these for yourself or a loved one! Your life could change in a drastic way in a short time. And, no matter what, they are well worth the cost. It's a small price to pay for an amazing difference in your health. I will actually be able to save a large amount of $$ every month because I will be able to eliminate many of the other isolated supplements I've been purchasing since there are so many nutrients I need in this beef liver that are more absorbable. I've tried just about everything out there with very slow to notice changes in the past 14 months.....sometimes it feels like you take one step forward and then 5 steps back in getting your health back on track. These little capsules have made the biggest change in my life in the short two weeks since I've received them. I am thrilled to say the least! I am making my second order now so that I'm sure I have them on hand and won't run out. I'm also anxiously awaiting the other products that will be offered by this company. This is a company with high integrity and I really love that....and I also love that I'm supporting a smaller business and not a mega drug company. By the way, I am offering this review for you because I am excited about and absolutely love this product and I truly hope others will read this and benefit from this particular supplement. I have not received any discounts or product offerings for this review. I just personally always read reviews before purchasing products and I am particularly thankful when I see something that I can relate to by reading others experiences. So, if you have any condition that is weighing heavily on your health and feeling of wellness, I really think you will benefit more than just a little....you should hopefully notice great improvements, if you're like me. Hope you get this and hope you can reclaim your energy and overall feeling of wellness. Life is too short! Enjoy!